It was like being led into a room of Writer’s Secrets and opening a box marked, “Image Systems.” It was enough to turn this writer’s head around and wonder, “How did I ever think I could get to the soul of my story without digging into my imagination and pulling up just the right images to evoke my story’s world? In a recent workshop at the Society of Children’s Book Writers and Illustrators Conference in Massachusetts, author and teacher Tim Weed elaborated on the magic of imagery. The kind that takes us beyond surface descriptions to the essence of the story’s world. Writers do this, he says, with specific sensory details that are part of a broader category of images and integral to the story. The images come from the writer’s subconscious and hit the reader’s subconscious as well. For example: Tim Weed points out the imagery in Phillip Pullman’s The Golden Compass where there are, “…images of the north: icecaps, polar bears, the northern lights.” The north is the larger category of images and the rest are the all-important specifics. Have you ever considered your imagery, writers? I think it’s a game-changer and can take your writing from really good to beyond good. Thank you so much, Tim Weed. Imagery may be a writing secret to some but it’s an exciting gift to me. Here is my attempt. Not easy to try and make it right! But along with everything else writers think about I have found it thrilling to switch gears and put my focus where I dream. Perhaps we have all done this already. For me it has never been focused in quite this way. The passage is from my children’s middle-grade novel in progress. Maggie is nine years old. Maggie’s ocean cove was empty and the surf sounded sleepy, like a lullaby. She sniffed the salty air. It smelled different, more like honey and lemon peel. Uh oh, Grammy Apple’s scent. Grammy Apple and her witchy magic? She closed her eyes and felt herself floating in a wide-awake dream. Suddenly little white clamshells, lots of them, and inky blue mussel shells sketched themselves into a fancy flower pattern on the wet sand. Maggie stared at the shells arranged like petals with strings of seaweed for stems. Draw, draw the shells my darling grandchild. The words slid right down the dunes into Maggie’s ears. You will be accepted into the Nantucket Art Fair. Imagery, the kind Tim Weed is talking about, is a challenge! But go ahead, writers! Editing is what we do over and over, until our gut tells us, “Yes! I’ve got it!” Isn’t it worth it? You know there is no better feeling in the universe, right? 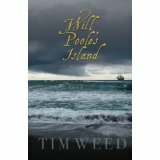 With the images of the visual artist, the cover of Will Poole’s Island evokes a gray, moody ocean with a lone boat that looks very small on the dark horizon. We get a strong feeling of the book. Word of the Moment: Imagery, as in writerly imaginings. Thanks Cynthia! I’m so glad you enjoyed the workshop.